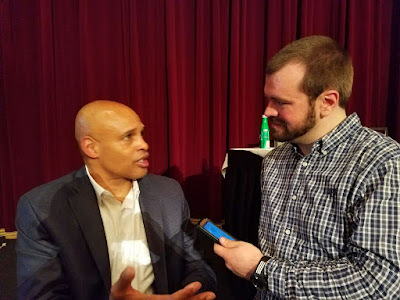 Clark Kellogg with the author. Photo courtesy of Derrel Johnson. Clark Kellogg will be giving commentary in the studio for CBS and Turner Sports' coverage of the NCAA Tournament. I caught up with Kellogg at March Madness Media Day, and we chatted about Villanova, the Big East, and the issue of paying players in college sports. Jason Schott: Do you think Villanova can repeat? Clark Kellogg: Oh yeah. I called that back in December based on the landscape and not seeing any dominant teams. I do think if Carolina can get it tied together, I think there's a psychological plus when you've gone as far as they did and you come up just short with pretty much the same group of guys. I think if they can get that far again it will lend itself well to them. I like Villanova's intangibles. They don't have the inside presence they had a year ago with (Daniel) Ochefu and, obviously, (Ryan) Arcidiacono, who's terrific. I think they found enough to replace Arcidiacono on the perimeter and if Darryl Reynolds can find a way to give them some consistent play. Quite honestly, there maybe only be one team, maybe two if they make an extended tournament run, they might be able to exploit them inside. More and more teams are playing small ball, and there are very that play it any better than Villanova. I think they've got a great chance (to repeat), they're one of my dozen or so that I think will be worth looking at as potential national champions, no doubt. JS: The thing that's interesting about the Big East is how you had Villanova, Butler, and Creighton at the top, and then all teams around .500 in conference, and even St. John's went 7-10 in conference, that's not bad. CK: Not bad at all, not bad at all. St. John's has made a nice move forward under Chris Mullin, which is great to see. Xavier has had some injuries unfortunately, then Creighton injuries, the loss of Moe Watson, then the subsequent issues with him off the court has been terribly disheartening, but that changed Creighton because I thought they were elite and Final Four level prior to the Watson injury. So, therefore, you have the two at the top (Villanova and Butler), then the great dump rest of the conference, and we'll see how it plays out. Clearly, Villanova the favorite, then Butler a team that I think can do damage in the tournament just based on how they play, they rarely beat themselves...I like the way Butler plays, and they beat Arizona earlier. They got playmakers, experience, toughness, they've got the things you want to see in teams that advance this time of year. JS: What progress have you seen in regards to the issue of paying the players in the past year? CK: Well, I've seen a number of conferences and schools go to the cost-of-attendance model, which is part of how you give the student-athlete the full benefits of the scholarship. My position has always been, Jason, the trade-off is athletic ability for education, so it's incumbent upon the athlete and the institutions to make sure they get the education piece because that's what your basketball ability is buying you. It's about an education, so take advantage of that, and then as long as the cost of being in college doesn't create any financial burden on the student-athlete, which is where the cost-of-attendance comes in, I think it's a good trade-off with our model. It's only a handful of programs that make money in intercollegiate athletics, and it's not about making money. Developing as an individual and, if you happen to have pro ability and choose to go to college to develop, you should also think about taking advantage of the education piece because that has value and it has monetary value. So, paying them is not something that I endorse. Cost-of-attendance, a little extra stipend that's built into that cost of attendance because kids that go to college, whether they're on scholarship or not, have expenses. It's not just tuition and room-and-board, there's other things you have to be able to pay for. A full scholarship should cover all of that, and then be creative. If you finish in a certain period of time, based on merchandise licensing, put a certain amount of that money away for the student-athlete to have at the end of the line. JS: Yeah, if a school is selling a jersey with a kid's name on it. CK: Those kinds of things, the business element is unable to be enjoyed by the student-athlete while he's a student-athlete, well, put some contingencies on it and put that pile of money aside and tie it to finishing your education or when you complete your time in good standing, then there's a piece of that income available for you, those are the kinds of things, health care. They already have cases of guys leaving early, you can go back to your school and pay for your education. I did that when I left a year early, way back in '82 and Ohio State contributed to paying for it when I finished up. There's ways to get around the pay. The other issue is it's only a small percentage of athletes. It's primarily football and basketball, 350 teams in basketball, and you even reduce that to 40 or 50 big-time teams. 80 or 90 programs in basketball, say 60 or 70 in football, you do the numbers, that's a small percentage of all the student-athletes that are on scholarship. Pay: no. Cost-of-attendance, making sure the education experience is what it needs to be, those are things that I strongly endorse. JS: Obviously, the television contract for the ACC and the Big East is a bit different than the one for the NEC, for example. CK: It's apples and oranges, and you have to be true to what your resources are with the idea of giving your student-athletes the resources they need to develop as best they can in their sport and in terms of their education, and whatever finances are needed to make that happen, that's what we should be focusing on. JS: I think one thing that would help is to do away with the rule that you must be 19 years old to go to the NBA, that would mostly eliminate one-and-dones. CK: I think that's a good suggestion and I think it would be a good solution to have a collectively-bargained deal between the NBA and its players association. Right now, it is 19 and one year removed from high school. The (NBA) Developmental League is really growing, enhancing resources for kids who may not want to come to college. You can go through the Development League. So those are options because not every kid is designed to be in college or isn't best-served by being in college. That's fine, but if you do go, I think you should be fully planted there with the idea of getting your education. JS: Villanova had a lot of four-year players and that made their run last year unique and probably gave them an advantage in the tournament. CK: There are going to be certain programs that are going to have that. Gonzaga typically has red-shirted seniors, fourth- and fifth-year seniors. Villanova does it that way, Butler does, I mean, there's a number of programs. And again, there's only a small number of guys every year, Jason. How many guys leave early? 50? Come on man! 100 put their name in, 60 take it out, 15 of them get drafted, and the others fight to see if they can make it as pros. I think it gets far too much attention. There's far too small a number for the attention it gets, it really is. We're getting better. Dan Gavitt gave us numbers about the improvement of graduation rates of Division 1 men's basketball players, thrilling news. The improvement of African-American basketball players graduation rates, improving over the last few years. Those are the numbers we should be talking about, making sure the trade-off is realized, that it's realized. It's a crime when kids are in school at good institutions, resources available, and don't finish or don't move towards a meaningful degree. That's a crime. It's a two-way street. The student-athlete has to be committed, but the university has the influence and the power and the care to make that a priority, and more and more of them are doing it, which great to see, and that's what it's about. JS: What about a place like Kentucky, where most of their players are one-and-dones? CK: At a place like Kentucky, that is a place where you're going to have a good number of pro-caliber players every year the way (John) Calipari recruits. That's the one place that you can document that 30 percent, 35 percent of their guys are NBA guys, so you approach it a touch differently, and yet they still have good academic track records. Now, how many of them will continue to go on and finish school? That's a personal call. If you leave and pursue your dream of becoming a pro and can make a living doing that, more power to you, that's what you should do. I've been one that always encourages guys, your life is more than what you do, it's how you live, so education has value in that. Income is important, finances are important, they're empowering but the totality of your life, basketball is a career based on mortality rates, if you live to be 80 years old, basketball at best, at best, is going to be a third of that, at best, at best. So, there's other elements that you should be developing, and athletics gives you a chance to do that, education gives you a guarantee of doing that if you pursue it. I like the fact that you can pursue that guarantee, and have it paid for, and still realize your dream of being a pro, but that's an individual call. Each person has to determine what they want out of their own life and their journey.